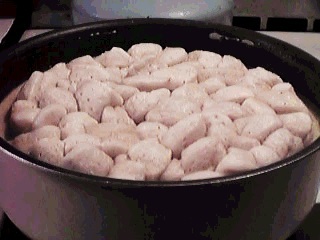 This recipe came with the wife; chicken and dumplings is one of her favorite meals. She got the recipe from her cousin, Patty and it has been in the family for many years. It only takes a little less than hour to prepare but looks and tastes like you spent all day in preparation. If whole chicken, remove most of the skin. Simmer the chicken or chicken breasts in water until meat is tear-apart tender (about 30 minutes). Remove the chicken from the cooking liquid. Debone chicken and break into bite-sized pieces. Return the meat to the cooking broth. Pour off broth until liquid just covers the chicken meat. Add one can of cream of chicken soup. Heat and stir. If the mixture doesn't thicken enough with the addition of the soup (a gravy consistency), add a few tablespoons of flour to thicken. Open cans of biscuits. Cut each biscuit into quarters with kitchen shears. Drop the biscuit quarters onto the top of the simmering chicken and broth mixture. With a spoon, turn each added biscuit quarter to coat with broth. This will keep the biscuit quarters from sticking together. Cover with lid and allow the mixture to boil lightly. The biscuits will rise. When the biscuits are cooked, about four or five minutes, the dish is reaady to serve.